Lively pub with an excellent and wide selection of ales. Enjoyed the Wolf Gold Jackal. The crib players mentioned in the 2013 review were still there! Somehow we saved the best pub until last again on our 11 pub crawl of Norwich. This is a fantastic little pub situated next to the river. There was a good selection of ales and ciders - Lacons Saint Nick's, Adnams Ghost Ship, Partners Stout & About, Moon Gazer Winter Porter, Orkney Northern Light, Woodfordes Wherry, Sharps Doom Bar, Wolf For Fox Sake & Golden Jackal, Farmer Jims Dry & Kingfisher Farm Cider. We decided to finish with two halves. But I very nearly ended up with 2 pints. Whilst I could have happily stayed for more, we had a train to catch. I need to make a note to try this pub much earlier in the day next time. As it's worth spending a lot longer here. 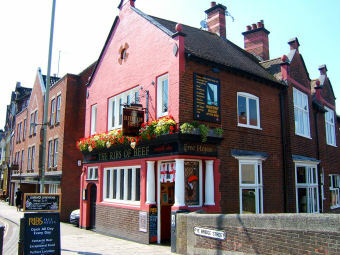 Norwich is a great city for pubs and whilst we didn't get to the Fat Cat on this visit, the Ribs of Beef did almost make up for it. Good pub on the bridge opposite The Mischief. Good beer selction. Ideal place to start a trip up Magdalen Street to The Kings Head and The Plasterers. Give them all a visit. Very good pub indeed. 9 cask ales available, pleasant location by the river. Shame they don't do food in an evening and the wifi wasn't working but that's me being a bit picky I suppose! Overall, well worth a visit, by far the best pub I've come across in that part of Norwich. A gem of a pub. I visited it for the first time last week and it was so good we returned today (I live in Herts). Worth travelling for.